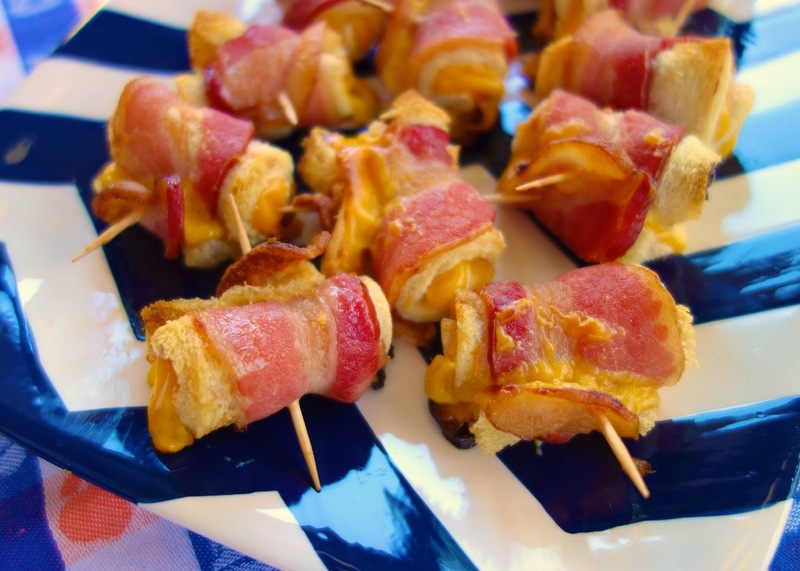 These Cheesy Bacon Roll Ups are totally addictive. How could they not be? Bread, cheese and bacon rolled up in one bite! OMG - heaven in my mouth! I had some thing similar to this at a Christmas party a million years ago . I wasn't into cooking as much back then, so I didn't ask for the recipe. *Dang it! 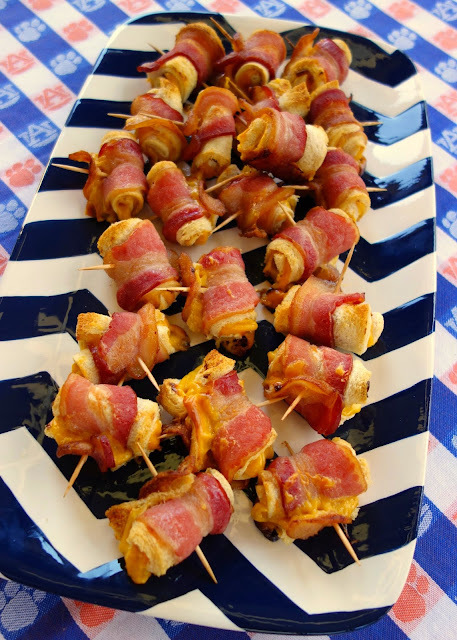 * I was thinking of new tailgating recipes for this season, and I decided to try and recreate the appetizer from the Christmas party. I think I hit the nail on the head. These are SO good! You can assemble these ahead of time and bake them right before you are ready to serve them. Make as many or as few as you need. These are great for a party or even breakfast. Be warned - it is impossible to eat just one (or ten)! Cut off bread crusts. Flatten bread with a rolling pin. Cut bread slice in half. Spread each half with cheese whiz. Cut bacon slices in half. Place bread slice on top of bacon half (cheese side up). Roll up and secure with toothpick. Repeat with remaining bread and bacon. Place a baking rack on a foil lined pan. Place bacon roll ups on rack and bake 25-30 minutes, until bacon is crispy. this is right up my football food alley, thanks! Wow two of my favorite things combined! Can't go wrong with this! You should try cream of mushroom soup (straight out of the can) instead of the cheese whiz. I know it sounds weird, but give it a try! Love your blog. Going to make these this weekend for the game !! BUT NO cats are ever allowed on my table or near my food. YUCK ! Yum! 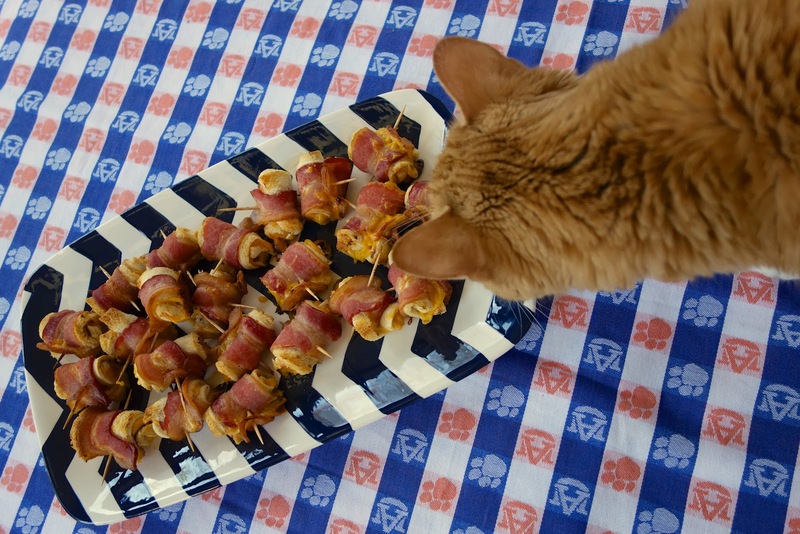 It's recipes like these that make me extra sad that Quinn doesn't like bacon. I had these years ago with cream cheese spread on them and an olive rolled in the middle. I had forgotten all about them. They we're delish! Love the cheese whiz variation! Thanks so much!! I love anything that you can make ahead of time! Thanks for another great time saving recipe! plus it has bacon - so you know it good! Easy & Good - you can't go wrong! Love make ahead appetizers!!!!! These sound great! These look very, very dangerous! They are very dangerous! I just kept popping them in my mouth saying "Last one" - HA!